StateWays | www.stateways.com | January/February 2017 23 ABSOLUT OFFERS A VAP FOR OFFPREMISE that gives consumers all the ingredients needed to make a Moscow Mule or a Bloody Mary at home. 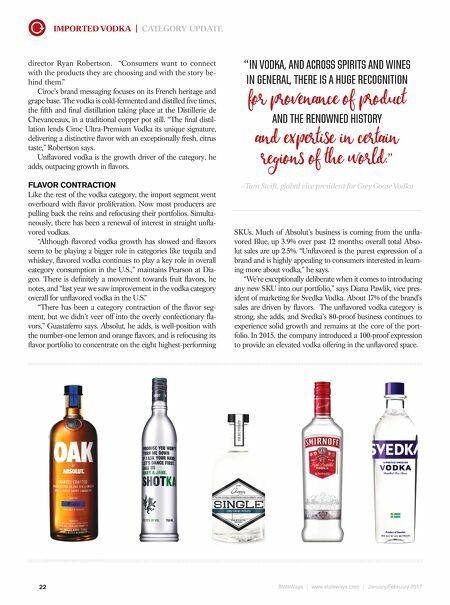 BAR BOOSTERS A number of on-premise trends are increasing vodka's mixology rep- utation, and those can translate to off-premise sales. "Not so long ago, some mixologists would not carry any vodka at all, but now bartenders are rediscovering vodkas, the nuances in taste, and how they work differently in various cocktails," says Sobieski's Guillant. Vodka bars are offering fl ights of different types for customers to appreciate those differences. Guillant suggests that retailers shelve vodkas by type of base spirit to better help cus- tomers navigate the category in stores. "Customers who love rye- based whiskey might be willing to experiment with a rye vodka, or a Bourbon drinker might take a chance on a corn-based vodka," he suggests. "We are seeing a number of classic cocktails re-imagined—the Moscow Mule, the Cosmo and even renewed interest in the Vodka Martini," Guastaferro says. 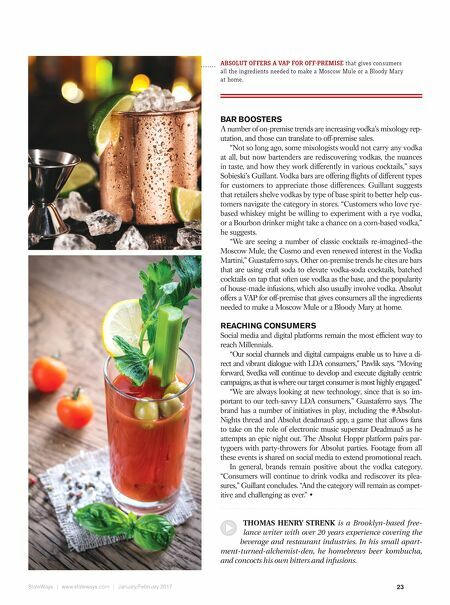 Other on-premise trends he cites are bars that are using craft soda to elevate vodka-soda cocktails, batched cocktails on tap that often use vodka as the base, and the popularity of house-made infusions, which also usually involve vodka. Absolut offers a VAP for off-premise that gives consumers all the ingredients needed to make a Moscow Mule or a Bloody Mary at home. REACHING CONSUMERS Social media and digital platforms remain the most effi cient way to reach Millennials. "Our social channels and digital campaigns enable us to have a di- rect and vibrant dialogue with LDA consumers," Pawlik says. "Moving forward, Svedka will continue to develop and execute digitally centric campaigns, as that is where our target consumer is most highly engaged." "We are always looking at new technology, since that is so im- portant to our tech-savvy LDA consumers," Guastaferro says. The brand has a number of initiatives in play, including the #Absolut- Nights thread and Absolut deadmau5 app, a game that allows fans to take on the role of electronic music superstar Deadmau5 as he attempts an epic night out. The Absolut Hoppr platform pairs par- tygoers with party-throwers for Absolut parties. Footage from all these events is shared on social media to extend promotional reach. In general, brands remain positive about the vodka category. "Consumers will continue to drink vodka and rediscover its plea- sures," Guillant concludes. "And the category will remain as compet- itive and challenging as ever." • THOMAS HENRY STRENK is a Brooklyn-based free- lance writer with over 20 years experience covering the beverage and restaurant industries. In his small apart- ment-turned-alchemist-den, he homebrews beer kombucha, and concocts his own bitters and infusions.